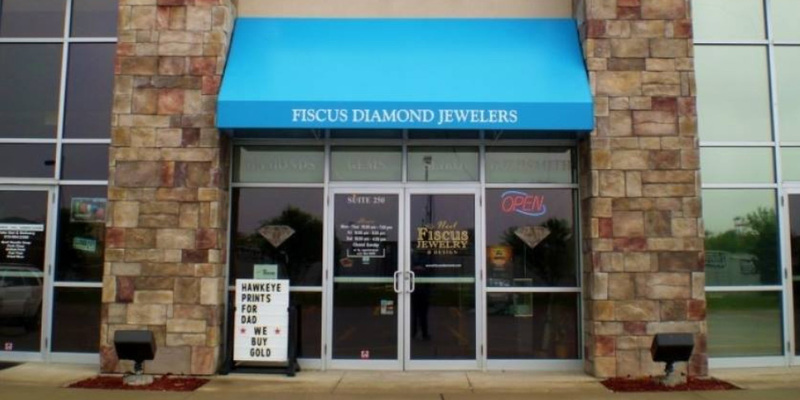 Fiscus Diamond Jewelers is a local jewelry business in Ankeny, Iowa specializing in custom designed jewelry, diamonds, gem stones, wedding bands and pearls. We also offer complete jewelry repairs including watches. Stop in and see us today, we’d love to help you out! Direct communication is essential in creating a fine piece of custom jewelry. Come enjoy our no pressure, relaxed atmosphere, where we want you to feel special. We want to help you create that perfect piece of jewelry that will last a lifetime. We offer high-quality diamonds and fine jewelry at outstanding prices. We’re confident you won’t find a better quality diamond or piece of jewelry for the price. It takes more time and skill to cut a diamond to ideal or near ideal proportions. Ideal cut diamonds have up to 90% light return and a normal cut diamond may only have 74%. While diamonds are beautiful, only by comparing stones will you be able to appreciate what makes one more valuable than another.Visit our store in Ankeny to see our great selection and prices. We have recently added the Diamond Emotions line including many bridal styles you’ve never seen before! We are dedicated to helping you find or create a unique piece of jewelry. Come visit us to see our extensive diamond selection and experience our unmatched customer service.Our jewelers will help you choose a beautiful stone that combines the qualities of the four C’s you most value. When you are ready to give the most enduring gift of love, let Noel Fiscus Jewelry & Design help you select the stone that is right for you. Fiscus Diamond Jewelers recently announced its membership in the Independent Jewelers Organization (IJO), an international Buying Group and educational organization of independent retail jewelers. Fiscus Diamond Jewelers will be the area’s exclusive Master IJO Jeweler member. According to Noel Fiscus, owner of Fiscus Diamond Jewelers, the firm will be taking advantage of as many IJO membership benefits as possible. Benefits include direct access to the international diamond markeets of Antwerp, Belgium through the IO Buying Office located there. IJO membership also includes participation in the IJO Business College. Jewelers have the ability to enroll in a joint Gemology and Business Curriculum offered in conjunction with the gemolocical Institute of America (G.I.A.). The G.I.A. is athe non-profit organization that certifies diamond and color stone quality and also acts as the “Educational College” for the jewelry industry worldwide. Located at 1701 S.E. Delaware Ave., Fiscus Diamond Jewelers is now the area’s exclusive IJO member. The custom design process... The Custom Design process begins with your idea. Whether you have found an idea elsewhere, drawn up one or just want to describe your perfect piece of jewelry, we can sketch it for you. All you need to do is make an appointment with Noel or stop in and we’d be happy to help you get the process going. The second step... Many men have found the option of custom design very helpful because he can design an engagement just as unique as she is. The next step in the process is carving a wax model (lost wax casting) or use CAD (computer aided design) to create the ring or pendant. The finished product... These processes are done in-house from start to finish. Once the ring is cast into the metal of your choice then our jewelers set the stones and polish it. The custom design process is approximately one month start-to-finish. 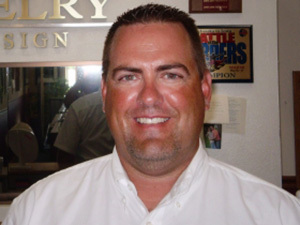 When we finish, we include a complitmentary appraisal and call you to pick up your new custom jewelry.